BEFORE placing the “single-stick” in your hand, it is our intention to put you through a short course of preliminary drill, the object of which is to teach you the free and active use of your limbs. When we have instructed you how to apply the full force of your muscular power, when we have demonstrated how you may best give proper effect to the “cuts and guards,” and finally, when we have indicated to you the best means of attaining to an easy pliability of strength in every position, both of attack and defence, then we shall allow you to arm yourself with your wooden representative of the sword, as you may then be considered to be in a position to employ it effectively. 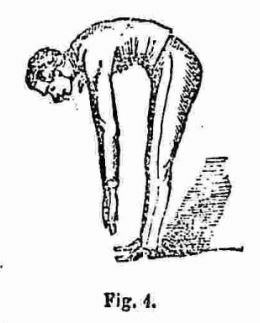 In our next paper we shall take up our weapon; meanwhile, let us proceed to what may be termed the A B C of the sword exercise, the “Extension motions and positions,” the object of which is to expand your chest, raise your head, throw back your shoulders, and strengthen the muscles of your back. FOUR.—At this order keep your arms and knees straight, and bend over until your hands touch your toes, your head being brought down in the same direction. (See Fig. 4.) Next resume the “third motion” by elevating your arms to the front. All the preceding motions must be gone through slowly and deliberately, so as to feel the exertion of the muscles throughout. The First and Second should occasionally be performed with your head turned as much as possible to the right or left. After you have practised these motions often enough to go through them quickly and readily, you may execute them from first to last without any pause or separate word of command, so as to make them all lead into each other. When you have mastered the “First Extension Motions,” you may proceed to execute the “FIRST POSITION,” which for greater clearness and simplicity, we will divide into three motions. 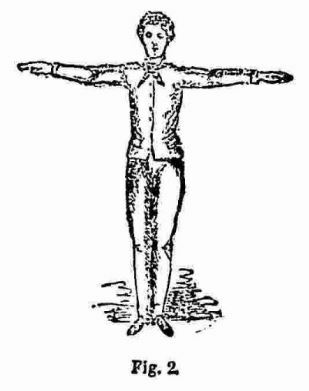 ONE.—At this order move your hands smartly to the rear, your left hand grasping your right arm just above the elbow, your right supporting your left arm beneath the elbow. TWO.—At this order make a half face to the right, turning on your heels in such a manner that the back of the left touches the inside of the right heel, your head retaining its position to the front. When you have gone through the above frequently, you may proceed to take the next step in your education, this being the “SECOND POSITION” in two motions. 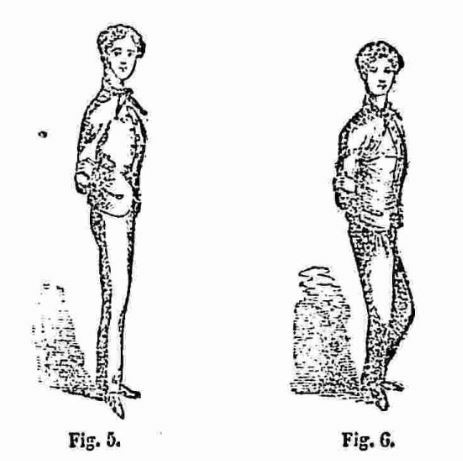 ONE.—Move your right foot about seven inches to the rear of your left heel, your toe lightly touching the ground, your left heel perpendicular to it; your knees kept well apart. A glance at our illustration, marked Fig. 8, will at once show what we mean. 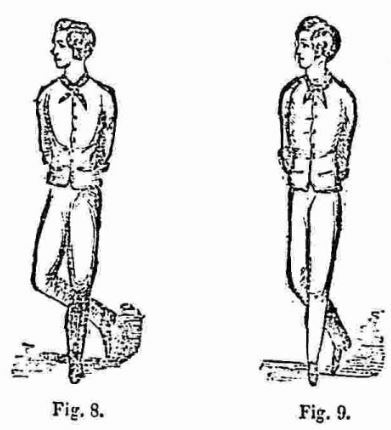 At the order, “First Position,” extend both your knees, and bring your right heel up to the left, assuming the position shown in our illustration, marked Fig. 10. We will now execute the “THIRD POSITION,” which has two motions. 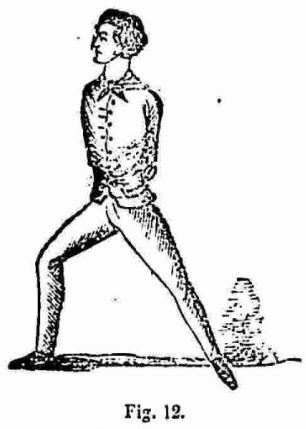 Supposing you to have gone through the foregoing movements at the command of a “Drill-instructor,” it will be the duty of the latter to come forward after the execution of each order, and prove the stability of your posture by slightly, but firmly, pressing upon your shoulders in each position. This pressure you should be able to bear without losing your position, at the same time there should be no unnecessary rigidity of pose, for you must remember that the object of the drill is to give the necessary flexibility to enable you to advance upon or retreat from your adversary. Let us now go through a few variations of the exercise. Execute each order, when demanded, according to our previous directions in the following order:—First Position—Second Position—First Position—Third Position — First Position— Second Position—Third Position—Second Position. SINGLE ATTACK.—At this order elevate your right foot and beat it smartly on the ground. DOUBLE ATTACK.—At this order elevate your right foot as before, and beat it upon the ground twice, first with your heel and after wards with the flat of your foot. 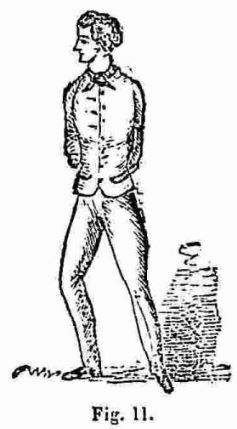 ADVANCE.—At this order throw forward your right foot a few inches, and place it smartly on the ground; next bring up your left foot about the same distance. SINGLE ATTACK.—To be executed as above. RETIRE.—At this order move your left foot lightly to the rear, balancing your body upon it; next move your right foot back the same distance, and place it upon the ground with a smart beat. DOUBLE ATTACK.—To be executed as above. It will greatly facilitate the study of the stick-drill to have the following list of words of command copied out in a large and legible hand, and read off by the drill-instructor to his squad—the squad, of course, executing each movement as it is ordered. When the student practises alone, he may stick up the list before him, and proceed to go through the exercise according to the word of command. Finally, whenever there is a doubt as to whether the movement has been properly executed, our instruction, already given at length, should be referred to. ATTENTION.—First extension motions (in five movements). One—two—three—four—five. 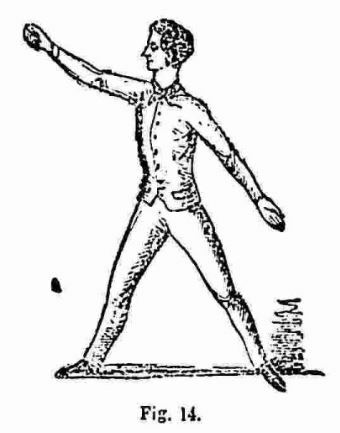 First position (in three movements). One—two—three. Second position (in two movements). One—two. Balance motions (in four movements). One—two—three—four. Third position (in two movements). One—two. Second extension motions (in three movements). One—two—three. First position. Front. Attention. The annexed are the words of command for the positions:—First, Second, First, Third, First, Second, Third, Second, Single Attack, Double Attack, Advance, Single Attack, Retire, Double Attack, Front, Attention. For the details of the whole of the foregoing, our pupils will refer to the paragraphs explanatory of each movement, which have been already given. Not many years ago; it would have been difficult to find a single scientific treatise relative to the weapon; but a clever French officer having conceived the idea of beguiling the tedium of garrison-life by making researches upon swords, he, after a long series of experiments, succeeded in evolving a theory, which has been received by military men as a very sound and sagacious one. We will quote a few of his deductions. According to his view, the hilt of the sword should be constructed of steel, with the pummel somewhat weighted. The grip should be smooth and narrow. In order to ensure a light, well-balanced weapon, he prescribes that the blade should be stouter near the point than at its lower portion. The metal of which the blade is manufactured ought to be such as will take a fine edge, and yet one that will resist a blow. Nothing will sooner destroy the edge of a sabre than the continued drawing and sheathing it in a metal scabbard. To obviate this, he advises that a piece of wood should be adapted to the interior of the scabbard which shall preserve the fine edge from contact with the metal in drawing or returning swords. The most effective cut is that which is effected by the combined motions of the upper and forearm, the wrist, and the sword in the hand. The French regulations for using the sword prescribe that the thumb should be placed upon the back of the hilt in striking. This is a mistake; for by so doing the motion of the hand and that of the wrist cannot have full play. Many swords have a very fine edge: this is attended with the disadvantage of weakness. In order to combine strength with an edge which cuts as though it were very sharp, the blade should be made more or less curved. More than all, this effect is produced by always dealing a blow—not in a chopping manner, that is to say, by striking perpendicularly from edge to back; but in cutting obliquely, or, in other words, from hilt to point. To a knowledge of this simple rule, combined with a great deal of practice, is due the success of all great sabreurs. A whole sheep is cut through, not by a chopping blow, which would not cause the sword to penetrate more than a few inches, but by an oblique or sawing one. The feat is performed with such rapidity, that we cannot see the action of the weapon, but science tells us that it could alone be accomplished by drawing through the carcass almost the entire length of the blade from hilt to point. The distinguished French swordsman, whose theory we have been elucidating, speaks throughout his book of the old British light cavalry sword as an admirable weapon. By way of confirming his remarks, we will quote from Captain Nolan—the same who fell so gloriously at Balaclava, and who was one of the best swordsmen and horsemen in the British army. 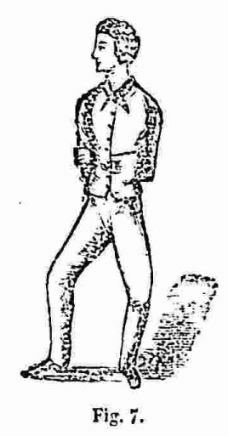 Had the old trooper been more scientific, he would, doubtless, have explained that the real reason for his comrades’ skill was that they used their weapons after the oblique mode—the natural way with all Easterns, who, moreover, have always been admirable as swordsmen—and that they were not spoiled by being taught the chopping style of delivery prevalent with Europeans. Continue on to PART III of this series. 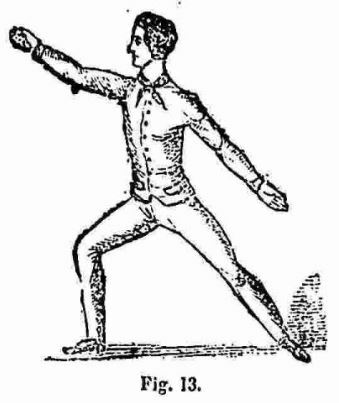 In the meantime, more vintage articles on self-defense can be accessed on our Resources page. « Manly Exercises. The Broadsword and Single-Stick. Part III.